In the middle of last week, Brooklynn woke up with a temperature of 103.5. We thought maybe she was just a little toasty from the night's sleep and would cool down at we ate breakfast, and we were right.She dropped to a chilly 103 flat. At that time of the morning, Rhiannon doesn't really have a chance to put in for a sub anymore without a major headache, so I stayed home. Yes, one of the benefits of my job is that no one has to come replace me if I'm gone for the day. Of course, depending on what I had planned for the day, there is a good chance that the work will still be waiting for me and one day closer to being due. C'est la vie, right? So I stayed home with Brooklynn and her furnace-like body temperature. She was mopey and lethargic and just wanted to sit on my lap and watch movies. A little medicine and breakfast perked her up for about 20 minutes and then back down she went. 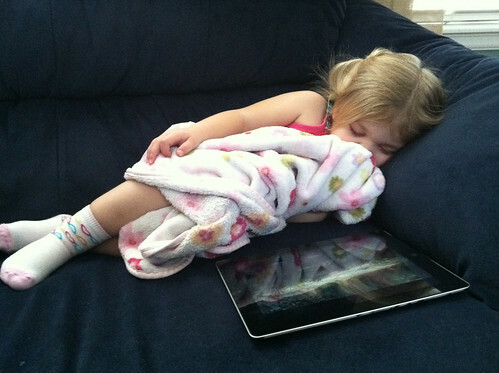 I left her on the couch with the iPad playing her Pooh Bear movie to get dressed myself and came back to find her passed out with the movie still playing. After photographing her, I carried her upstairs. She woke up just enough to inform me that she didn't want to go to bed, so we laid down in Daddy's bed. And she proceeded to sleep away the rest of the morning and be up all afternoon. The next day, she was even warmer in the morning and Rhiannon, with the benefit of a full day's warning, stayed home. Brooklynn was up all morning and slept the entire afternoon. We kept her home one more day on Friday, and with a trip to the doctor and general prescription of antibiotics, she's doing better. She still took 4 hour naps, but better. Yesterday, with no trace of fever, she headed back to school and proceeded to take a 1 hour nap after getting up early in the morning. We got to deal with a cranky toddler who didn't want to go to bed but was far too tired to stay up any longer. And this morning, after over 11 hours of sleep? I was told to walk away. As in, she yelled, "Walk away, Daddy" as I approached her bed to get her dressed [1. Rhiannon threatened to start giving me the same reaction when I wake her up in the mornings from now on.]. She ate breakfast in her pajamas. We're back to a normal routine of everyone going to work or school, but we're far from normal.